Hemp. Cannabis. CBD oil. An industry that is booming yet surrounded by stigma. How do two Asian-American women tap into this space, make it their own, and change the messaging around cannabis? Read more to find out. It was a warm summer evening when Christine invited me to her spacious New York City apartment off Park Avenue. She greeted me with homemade lychee oolong tea and a perfectly displayed chia pudding, both made with her special honey. Entrepreneurship happens because a problem is identified. Creating a business is a result of finding a solution and wanting to share it with the world. So, when we asked how she started, Christine mentioned it was organic. Felicity’s mother was diagnosed with asthma and adding CBD oil into her honey subsided her condition, enabling her to live a healthier life. This is how HoneyPot was born. Honey. A sweetener substitution. A topping in your acai bowl. A simple commodity that is immersed in our everyday routines. Just infused with premium cannabis, that’s all. HoneyPot makes it accessible to the masses - with total chic packaging. The duo moved forward with having people like Felicity’s mother in mind as the target consumer. The purpose of the product is to show people who may be afraid or unsure of how to consume cannabis, in order to gain the health and wellness benefits it offers. The brand has only been live for a year, but like to any start-up, feels like forever because you hustle after your main-hustle. The amount of natural success Christine and Felicity have accomplished has the public to assume that HoneyPot has been in the game for a bit. From early brand awareness by tabling at events in SF to now partnering with local brands such as MatchaBar! With the highs, comes the lows, too! No pun intended. Starting an unconventional product, comes with a lot of legality and compliance requirements. Fortunately, Felicity’s family has been in food manufacturing business for over 40 years and is available to provide resources and guidance to cementing their business. When it comes to product development, there is a whole slew of possible complications and a series of trial and error. When honey is extracted, each batch can be different. 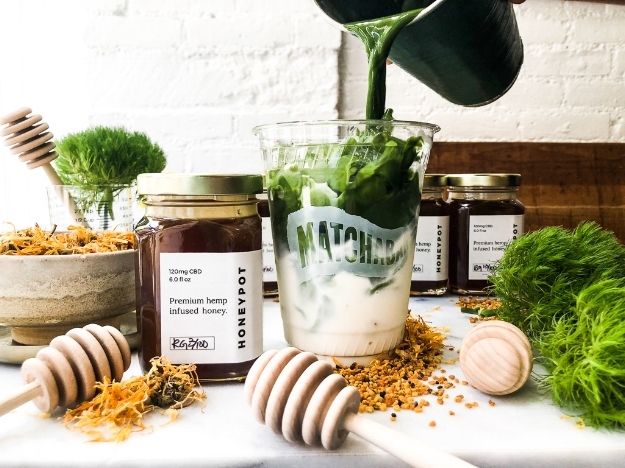 Whole and natural honey poses a unique challenge - taste and consistency can vary. But the two have embraced these variations by labeling each batch as a "vintage." Naturally, we touched upon the social justice component. The underlying message is HoneyPot is breaking norms, playing a role in the industry, and by developing a brand that is “not scary” is welcoming cannabis into our everyday lives. This is their way of displaying activism. Not only that, Christine uses her business as an education opportunity for others who are unfamiliar with this industry. Plus with knowledge, you can combat ignorant comments from the public, who may be uneducated or have strong feelings about being anti-cannabis. But the team leads with kindness, education, and honesty. We mentioned that Christine is Korean-American. Although it isn’t always about race, we wanted to note the importance why this matters. For anyone who grew up in the Asian-American community and/or is familiar with our upbringings, there are “traditional” career paths for a “safe and secured” future. We’re not shaming at all, but for Christine, she wanted to create a product that challenged the stigma and enhance lives. Making our parents proud is such a battle and when you’re doing something creative or different, it challenges their beliefs. But her parents received it better than she imagined, and this is good. She was afraid that if it was not well-received, what would she do? She learned that other Asian-Americans in the industry have hid it from their parents; their folks think they work in marketing or something. This spring, ABC7 News released a highlight video of Felicity sharing HoneyPot’s story and showing their hives. When Christine’s folks saw the segment, that was the validation and proud moment. And moving forward, her family is super “cool with it.” Drug Dealer it is. By now, we know the business is headed by Women of Color, and they partner with other women-operated only businesses, but did we mentioned that HoneyPot Supply is all self-funded? These two both worked full-time jobs while starting HoneyPot for the past year in business development and strategy roles, which they think has played to their advantage. Their lack of background in cannabis has been a challenge, but their outsiders perspective has been critical to HoneyPot's unique positioning: appealing to the "cannacurious" mass market while still providing plenty of empowerment to the "cannasseur". Felicity recently quit her startup role in San Francisco to pursue HoneyPot full-time. Emily and I are big on purpose and fulfillment, and self-care. So, we had to ask her one last question before we signed off… and it was my favorite quote of this entire interview. In a sick way, I feel like owning a business and having something that is your baby is kind of a form of self-care. You might be busier, but it nurtures your soul, gives you confidence, it’s something you’re doing for yourself, something you’re doing for others, and that’s my therapy. To learn more about Potli, you can visit www.getpotli.com. You can follow them on instagram @getpotli.